Abstract. 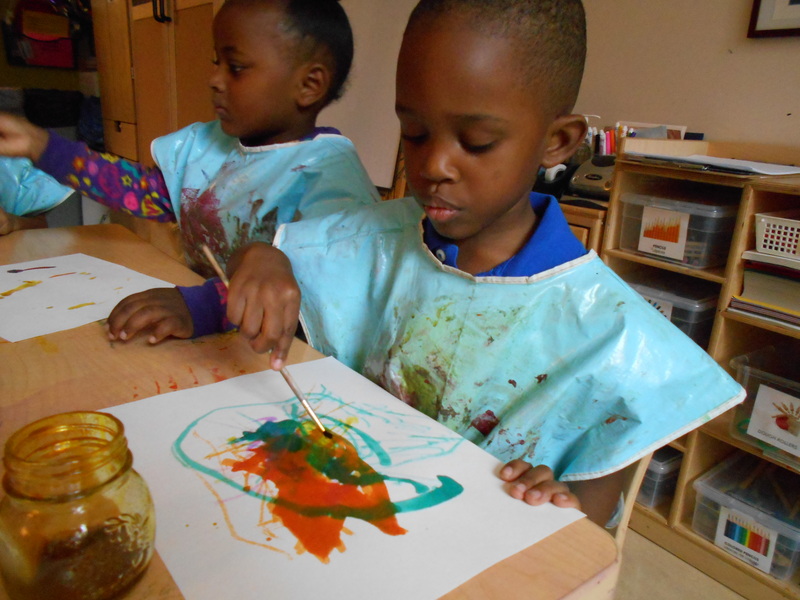 | Pre-K Art Stars! Art groups are in full swing in the PK Studio, and we’re continuing to work with and learn about new materials every week. 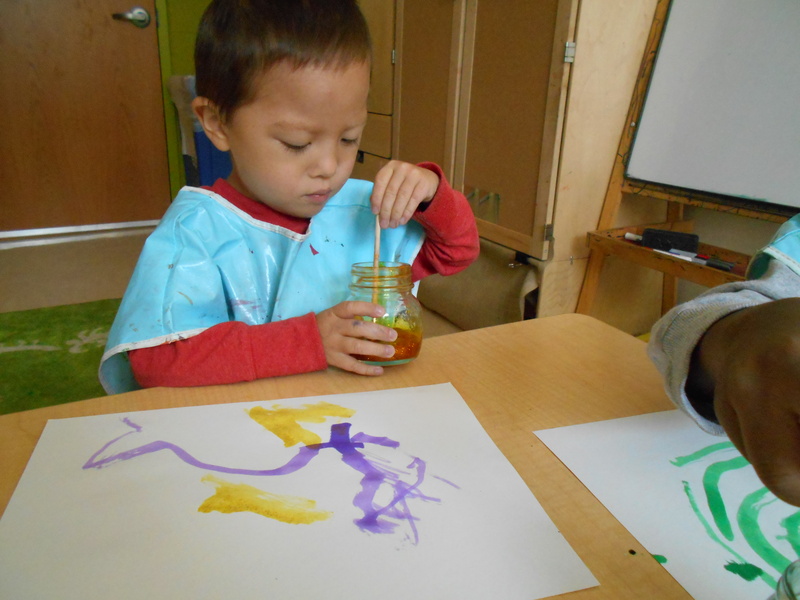 This past week, friends used liquid watercolors to make paintings. 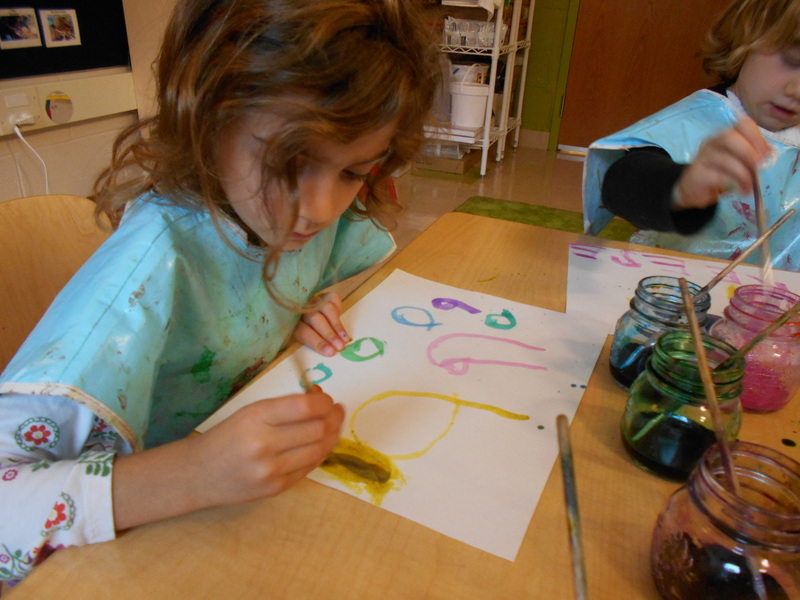 It was exciting to paint with watercolors after learning about tempera paint, because it allowed them to explore their similarities and differences. 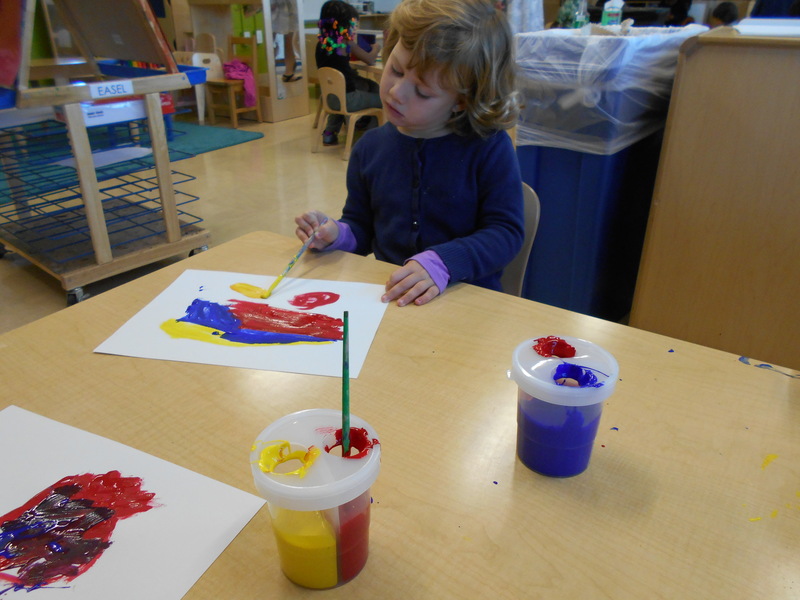 Friends enjoyed watching the paint settle into the paper, as well as laying colors to create one of a kind paintings! 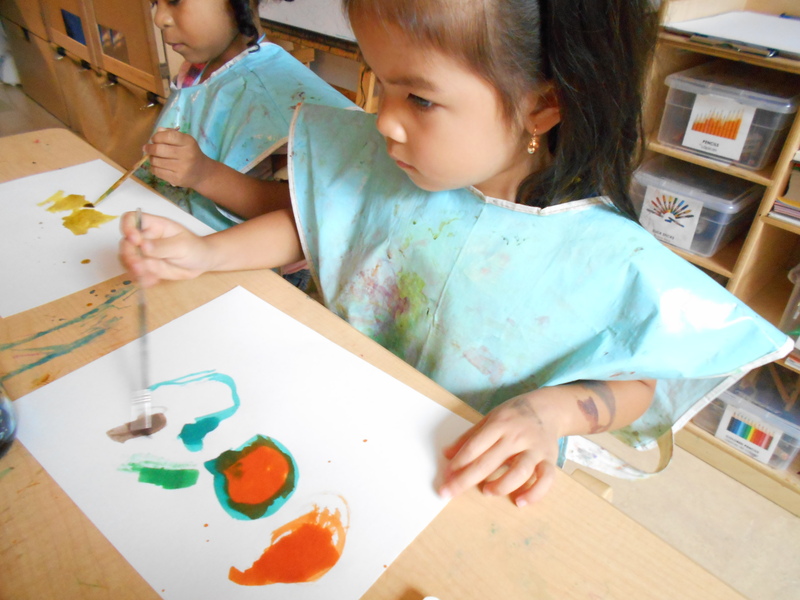 Before we could begin painting, friends practiced putting on smocks. William: Darby, let me help you with your smock. It goes like this… long part in the front, short part in the back. 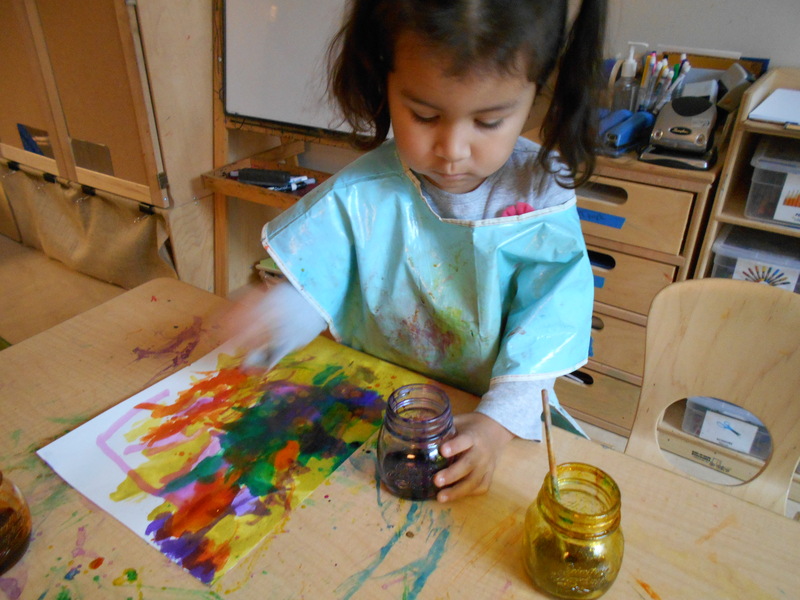 Reese: We wear smocks so we don’t get our clothes messy. In the PK Studio, we keep liquid watercolors in glass jars. Before we began painting, friends shared what they already knew about glass, and how to handle working with the fragile material. As you can see, children really covered all of the bases in regards to using glass jars in the Studio. Adrian: Don’t be rough with the jars or they will break. Jars are like a small bottle. Mae: If you drop the glass it’ll break all over the floor and it could hit your foot and your foot could get bloody and you will cry and the paint will be gone. Ra’Maya: Glasses have glass in them, too! Sophie: If you put the jar hard on the table, it could scare friends and also break. Selwyn: If we pick the jar up and throw it in the air, it would make a mess and it would break. Zoe: If you drop the glass it could break and you could step on it and your foot would bleed and you might not walk and your foot could fall off, so that’s why you have to be careful with glass. 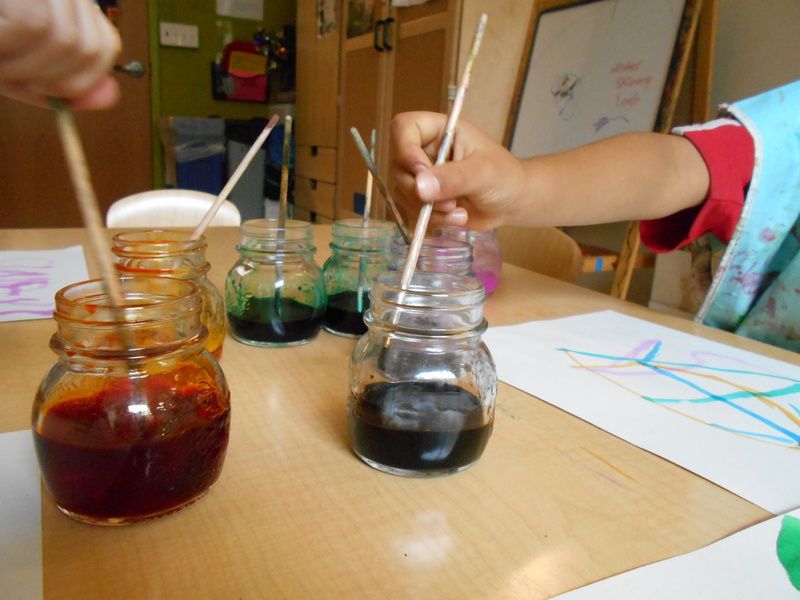 Friends also learned that if we want to mix colors, we mix colors on our paper and not in the jars. Sarah: Don’t put the pink brush in the blue jar because it’ll mix it all and no one can use the blue anymore because it’ll change to purple. Luke: You can’t trick us… we know the green brush goes in the green jar! Nayeli: I always don’t put the pink brush in the blue. Jax: Do I put the orange in the yellow? Nooooo! Do I put the orange in the blue? Nooooo! Do I put the orange in the orange? Yes! Finally… friends could get to work on their masterpieces! 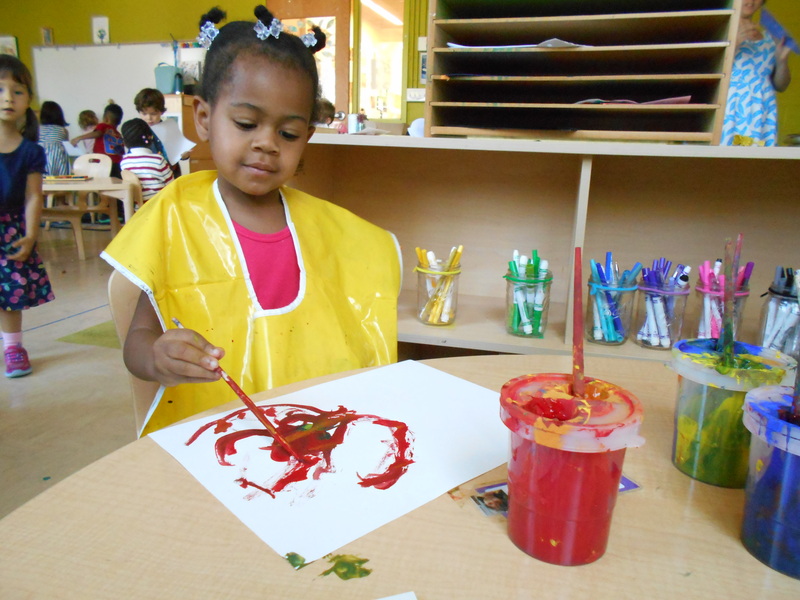 Naomi: If someone comes in, we could tell them they can come paint with us! 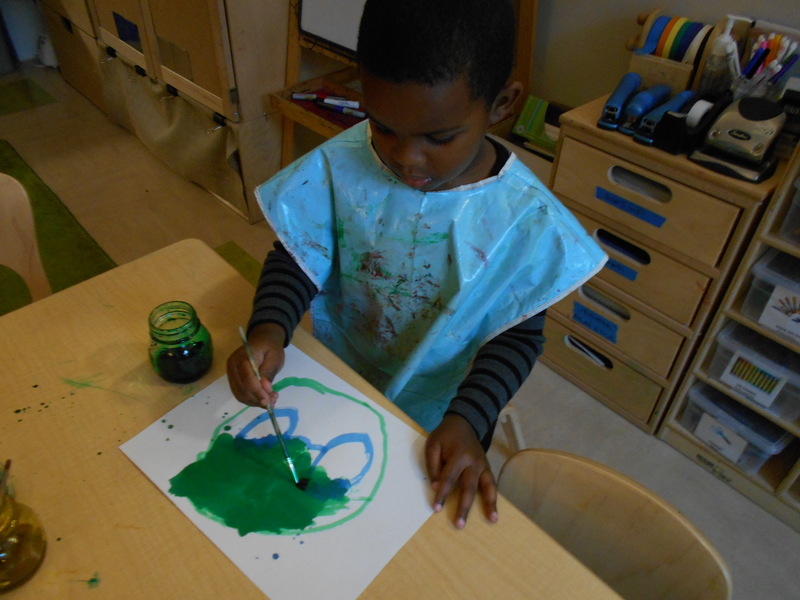 Marquis: The pink paint disappears when I put it on the green. Zavier: This yellow paint is sparkly and golden. Carlos: It’s amazing to use all the colors you want to make the color you want to make the most! Iris: How do watercolors dry so quickly? Maybe if you blow on the painting, it’ll dry up. Miguel: This yellow looks sparkly like pirates gold. Nneka: That color looks like emerald. Madison: Mine is beautiful because I know how to paint really well like an artist. Elijah: This looks like fern green, which is like our art group! It’s a light green, it’s fern green. Can I call you Ms.Fern? Florentina: Watercolors get sucked up into the paper faster than other paints. Look at the back of my paper… the paint sucked all the way through to the back! Isabella: Paintbrushes love the watercolors. They look like they are swimming in an ocean of pink paint! 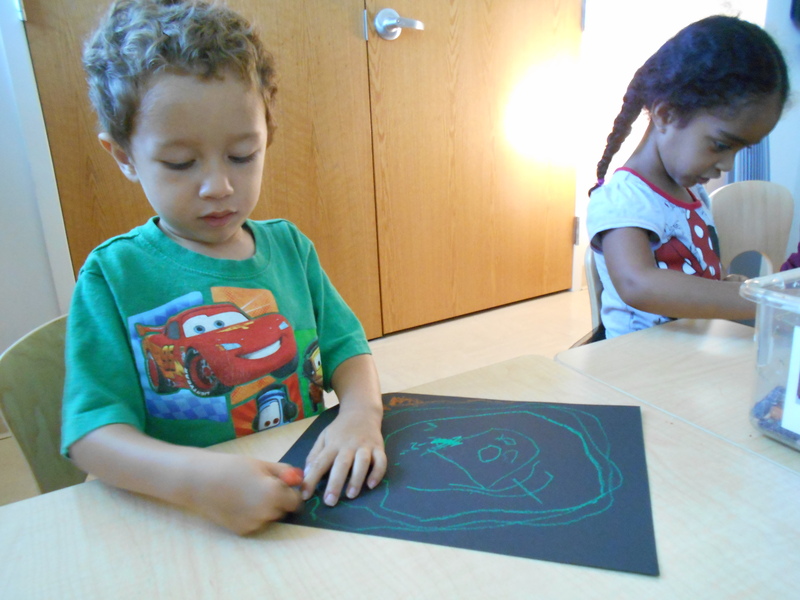 During the second week of school, Pre-K friends began working with oil pastels in the art area. It was exciting to compare and contrast crayons, which children have been working with since the beginning of the year, with oil pastels. 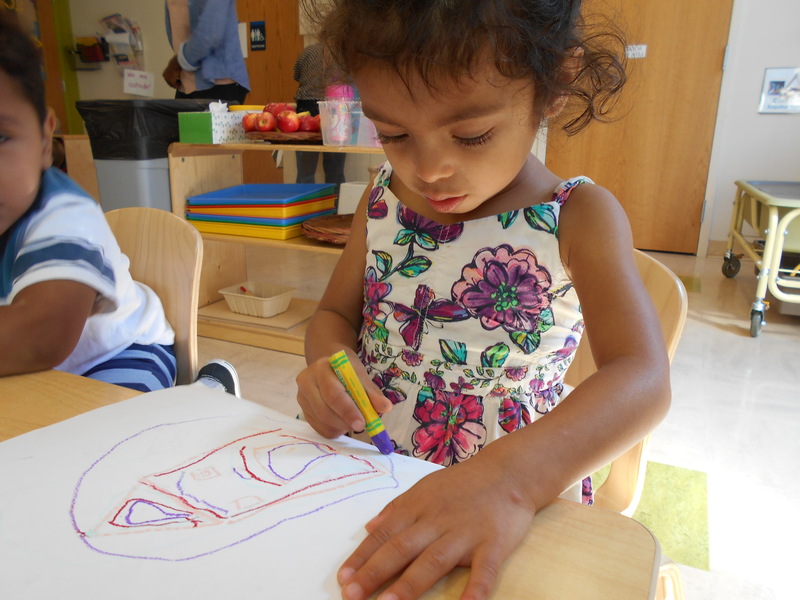 Children were able to draw freely as they acquainted themselves with the new material. 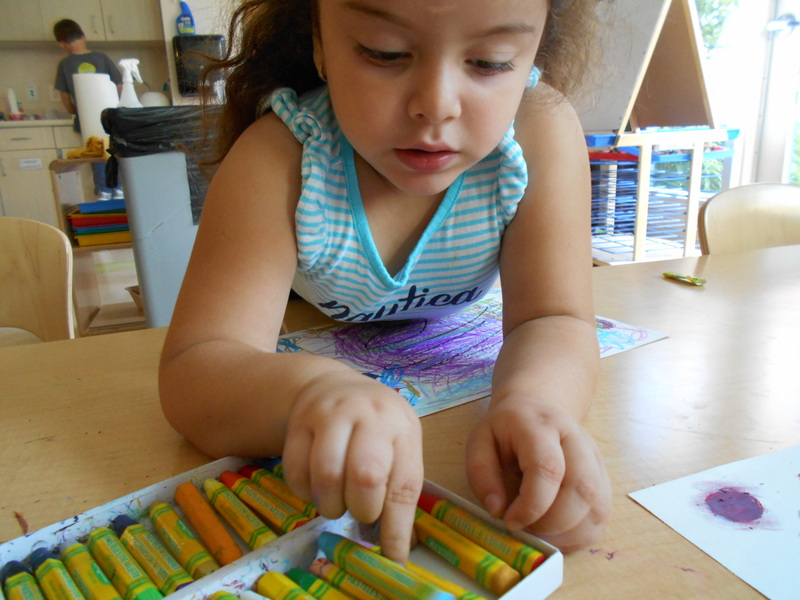 Once friends were finished with their masterpieces, they learned how to clean up oil pastels and where they could find them the next time they wanted to draw with them! 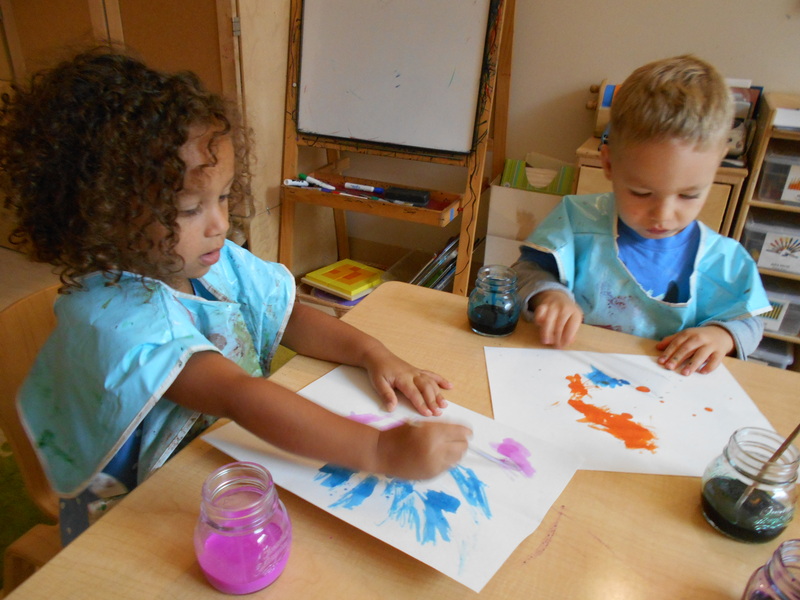 The third week of school was very exciting as we began learning about different types of paint! Friends learned about primary colors (red, yellow, blue) and how to mix them to create secondary colors (orange, green, purple). 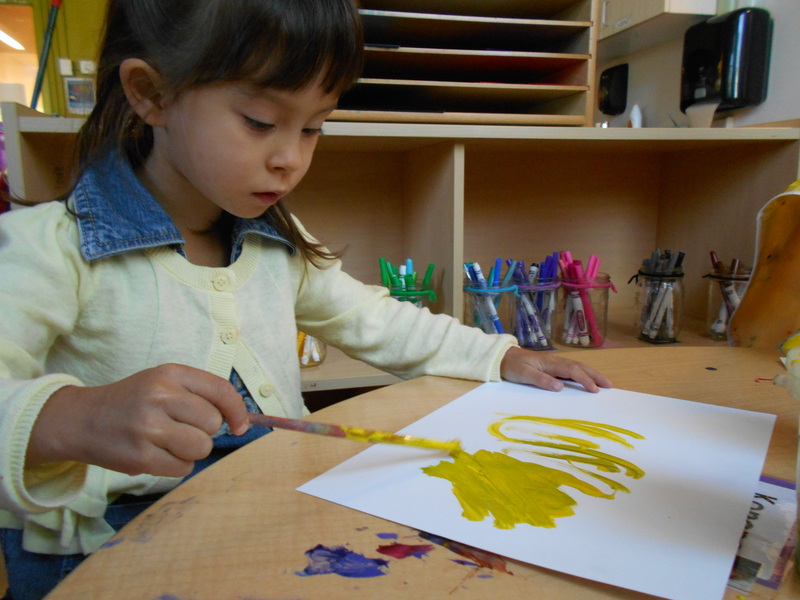 We practiced putting on smocks to protect our clothing, and learned how to carefully carry wet paintings to the drying rack. 6 days until our Spider Showcase! 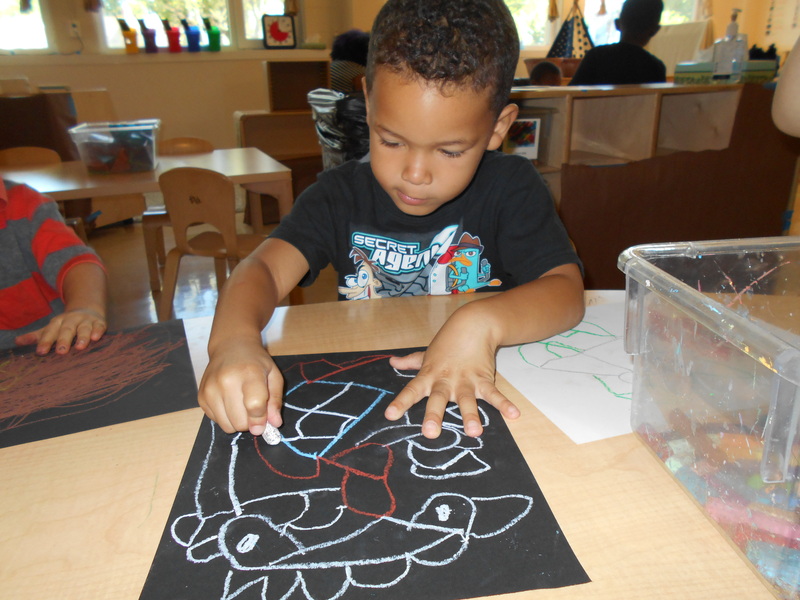 The first half of this video is from week one when children were working on spider web Gelli prints. The second half of the video is of friends stamping their hand carved spider stamps from Styrofoam! Make sure to stop by the Studio next Wednesday to see all of their work around spiders! Between selecting work for portfolios, and ice skating adventures, it feels like forever since we’ve been able to get messy in the Studio! 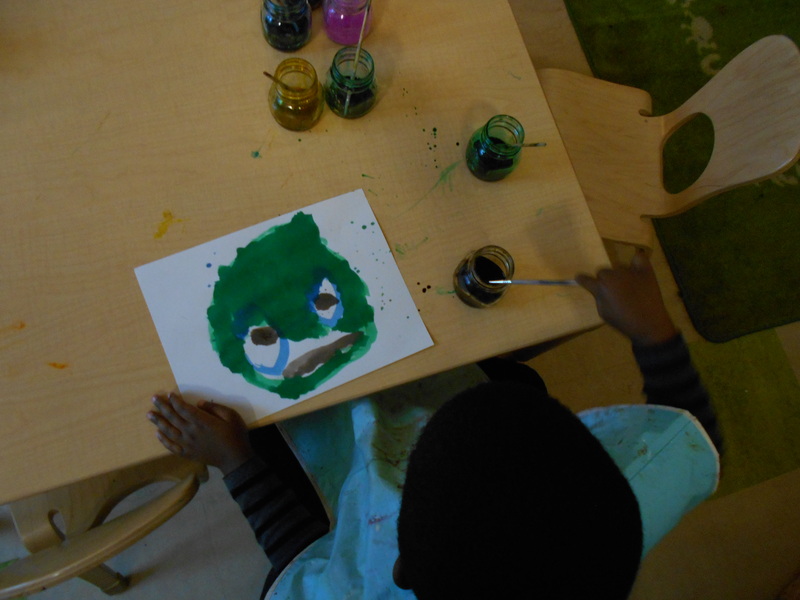 The week following winter break, children selected their favorite piece of art from the first half of the year for their portfolio. At the end of the year, they will share their work with their families! Abdoulaye: It’s like making footprints with something. Florentina: A print is a stamp from a stamper. Mackenzi: Is it like a printer? Zoe: I think it means you print out pictures you already made. Logan: You can print things that you love! Friends had many great guesses and were excited to use different types of stamps to explore printmaking. Children were curious about the process, especially when I brought over a tray of fruits and vegetables and explained that these would be the materials we would print with today! Ryler: It smells like celery in here! Are we going to have a taste test? Is that why we need smocks? Bennett: Can you print an apple? Friends got right to work on their fruit and vegetable prints. 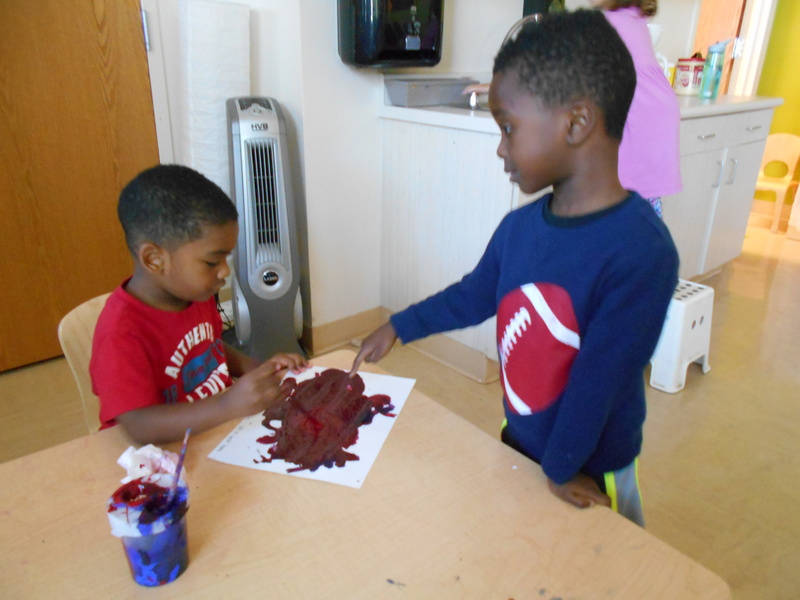 Children explored shape through the organic patterns in the fruit, as well as color mixing. Chrishelle: You can stamp to make a picture of a snowman. Sasha: You have to get the food dirty. Real food! Mouhammadou: I’m making a caterpillar out of celery. Celery looks like a beautiful paintbrush. It makes a different kind of painting. Miles: I’ve painted before, but never with a juicy orange! Ryler: I rubbed my finger and now it’s on the paper and my finger. I made lots of trees, a pattern, line, line sideways, line, line sideways. What do orange and purple make? Ronan: Why are these called oil pastels? They don’t look like oil to me. 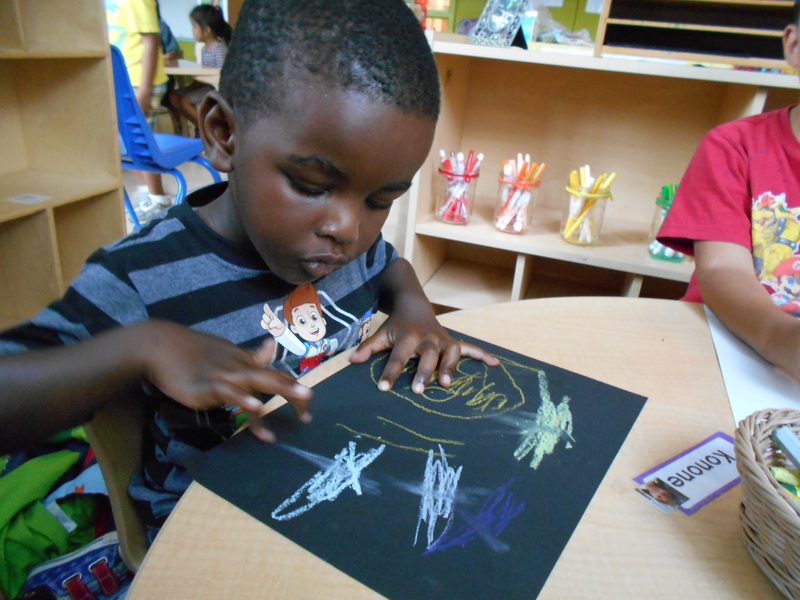 Moses: I want to try to make it white but the pastel is white and the paper is white so I think it won’t work. The white on the blue made it indigo now. I made ice cream but it’s too sweet for your bones. Mae: The colors turned to blue! Now it’s green… I made broccoli! I’m doing so much colors. Claire: When I squish them they are wonderful! Kofi: I remember, those are oil pastels! You can mix with them. Sylvie: Smudging is putting your one finger on it. Vivian: Let’s see how they make a person. If I put pink and black and purple, let’s see how I can smudge mine. Let’s see how it changes. What is the white going to do? 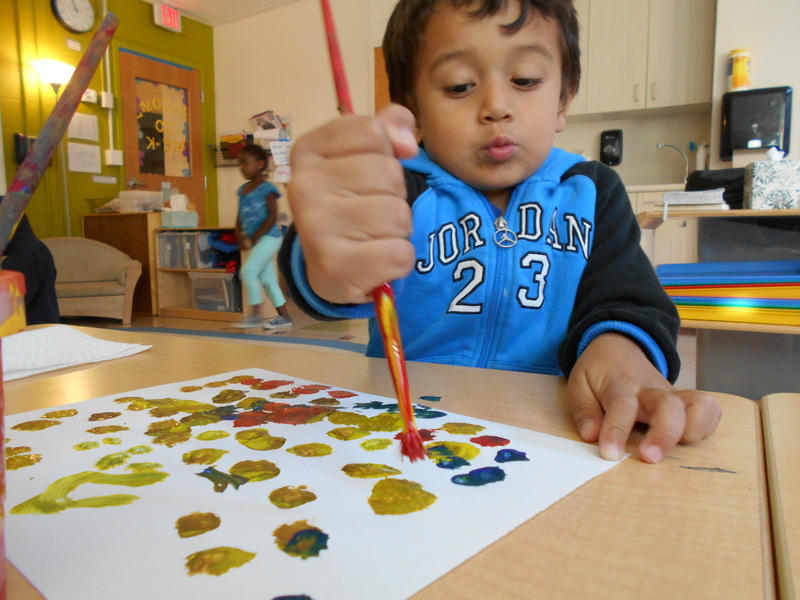 The third week of school was very exciting as we began learning about different types of paint! Friends learned about primary colors (red, yellow, blue) and how to mix them to create secondary colors (orange, green, purple). 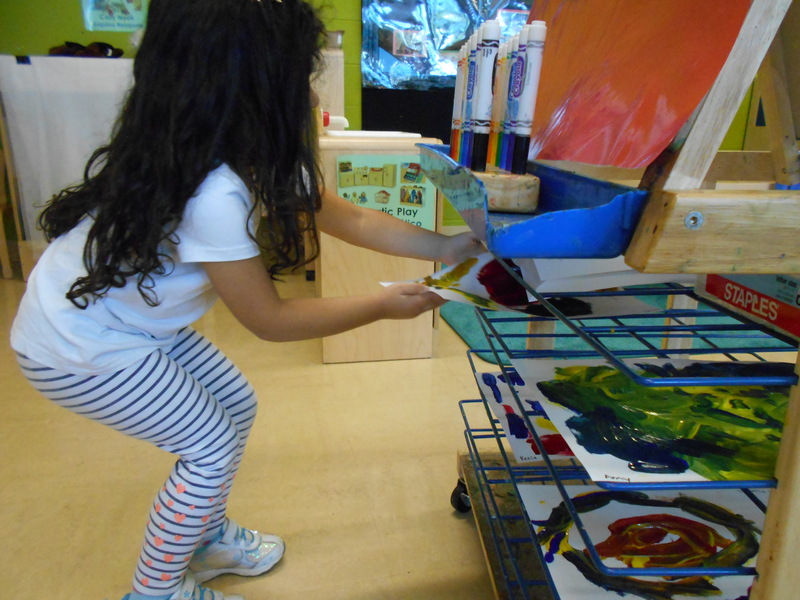 We practiced putting on smocks to protect our clothing, and learned how to carefully carry wet paintings to the drying rack. Next week, we will begin art groups in the Studio! Chrishelle: You have to brush it for a long time to turn it to another color. Madison: It turned black. How? 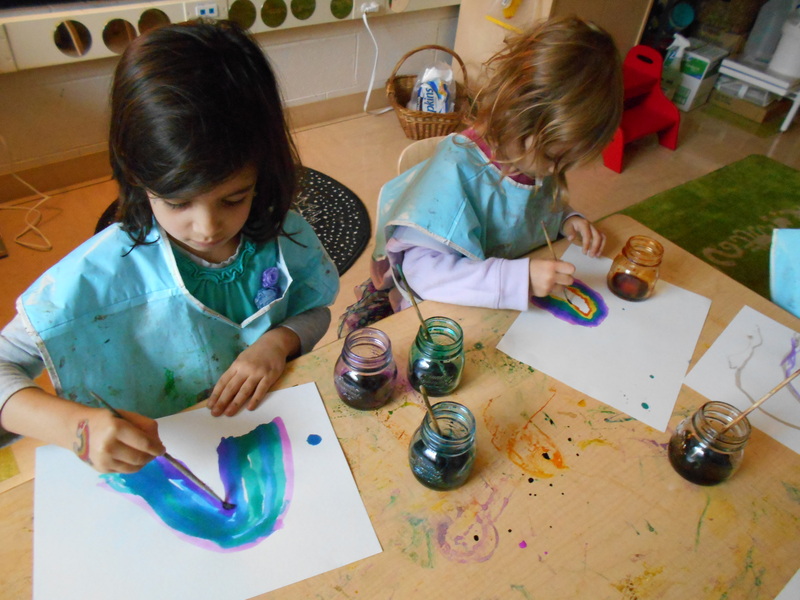 Mackenzi: I can make a swirl with the blue. It swirled in red and made purple. 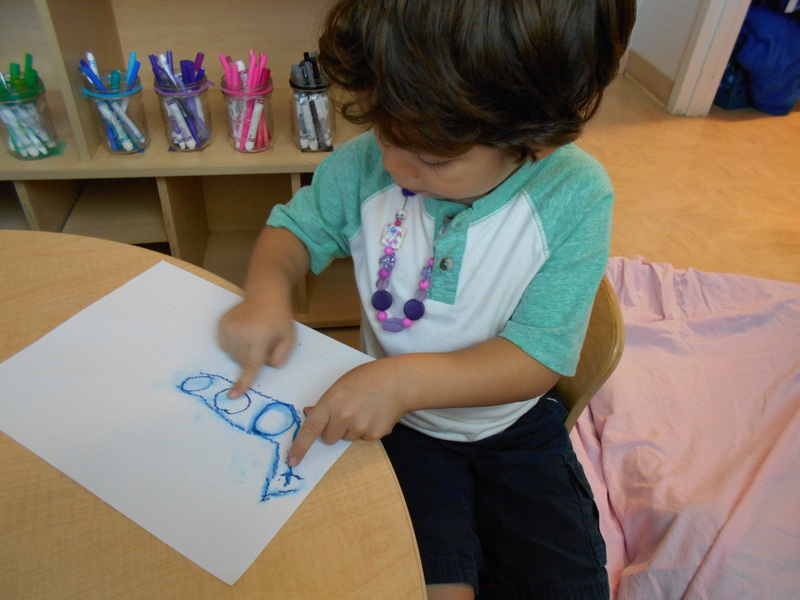 Adrian: I painted my name. It wasn’t hard to do it. Noah: Put on your paint jacket so you don’t get paint on your clothes. Isley: The paintbrush made it look like footprints. I made an elephant eating blueberry pancakes. Zavier: What does paint mean? Justin: I’m going to make the prettiest one of all! Zuri: I want to put it in the hall so everyone can see my painting!